Fifth-grader Ella Briggs, who was bullied at her old school, ran on a pro-LGBTQ rights platform. Since 2015, Connecticut has run a statewide civics program that encourages fifth-graders to run for election and vote for a “kid governor." 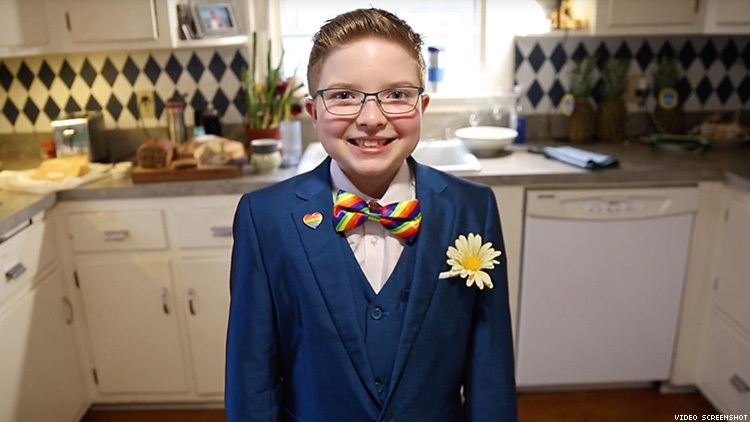 This year, 11-year-old gay Ella Briggs, who is gay and ran on a pro-LGBTQ platform, was sworn in as the “kid governor” at the Old State House in Hartford in January, according to Connecticut Post. “I will begin important conversations with students and adults all over this great state. We will talk about what it means to be accepting and respectful of everyone, including those of us in the LGBTQ community,” Briggs, who was wearing a blue suit with a rainbow bow tie and kitten heels, said at her swearing-in. Briggs, who attends the Ana Grace Academy of the Arts Elementary Magnet School in Avon, was elected by 6,400 fifth-graders from 87 schools across the state, but her journey as an openly gay student hasn’t been easy. At her former school in East Hampton, some kids ostracized her and called her a “dyke,” among other epithets. Meanwhile, some other kids refused to attend her inauguration, often at their parents’ behest, according to the Post. Briggs shared part of her story in a short video. “Then I’m like, actually, I like being a female. It’s a lot more fun,” Briggs said. The young politician has faced her share of backlash for identifying as a lesbian, including being shut down by a teacher who told her it’s “not appropriate” to discuss the subject. Watch the video of Briggs below. Does the Mueller Report Confirm Trump's Rumored Pee Tape?